Our BLG reader this week was Sam. He brought in an engrossing story by Bonny Becker and illustrated by Kady MacDonald Denton. 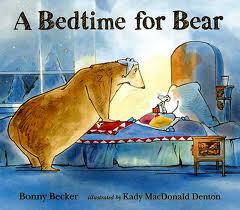 A Bedtime for Bear is all about a very particular Bear who needs everything to be just so in order to get to sleep. His friend Mouse, who comes to spend the night is not very capable of being calm, quiet and quick to settle down. This aggravates Bear just a little (well actually a LOT). A little bit of irony – this book was all about being quiet and my normally very noisy (in a charming sort of way 🙂 ) class sat silent and focussed during Sam’s reading except to giggle at how disruptive and annoying Mouse was to Bear. Strangely quiet! But I wasn’t about to complain! As the evening progresses in the story, we begin to realize that Bear wants Mouse up and about because he is a little nervous about a sound he heard. Miami was on to him, “He doesn’t want the mouse to go to bed because he is scared!” she shouted. Not much gets past us! Lisa: My favourite part is when the bear asks the mouse to check his closet. I think he did that because he was actually scared there was someone that lived in the closet. Kevin: My favourite part of the story is when they both fell asleep under the full moon. Ricky: That was a great book you read Sam! It had good pictures and good characters. This entry was posted in BLG Reads this week and tagged BLG Reads, Bonny Becker, favourite illustrators, great read alouds, Kady MacDonald Denton, picture books by carriegelson. Bookmark the permalink.